“WOOOOOOO! Recognize this? Chuckles. WOOOOOOOO! Retired? Yeah, retired, only in the minds of the wrestling world, never in my mind. You think March 30th, 2008, was the last day that Ric Flair was capable of walking into the ring? “THINK AGAIN! 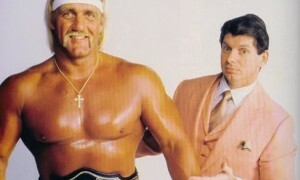 EVERY MAJOR PROMOTION IN THE WORLD WOULD LIKE TO HAVE A HANDLE ON THE NATURE BOY! There is only ONE, ONE, ONE, ONE, ONE, ONE, ONE sixteen time World Heavyweight Champion. There’s fives, there’s sevens, there’s tens, there’s gonna be twelves, maybe thirteens, there’s ONE! FACT BE KNOWN there’s 21 times, sixteen I’ll take credit for! The rest of them, are my personal business in countries I’ve been to. This promo if isn’t obvious, was delivered by the legendary “Nature Boy” Ric Flair, hyping up his international battle with the Immortal “Hollywood” Hulk Hogan. Don’t get me wrong, I always love “Natch” and his promos, more and more I get older, more I fall in-love with Flair’s in-ring work and his work on the mic from his prime in the late ‘80’s and early ‘90’s. But who would want to watch a guy who is either in his late 50’s (Hogan) or early 60’s (Flair) wrestle? Think about that for a while. Listening to an interview from Sunday, May 30th, 2010’s Ministry of Slam, they interviewed Ric Flair. The “Nature Boy” told them that before he signed with TNA, he went and talked to Shawn Michaels and asked him if he’s okay with him coming back to the ring and started to wrestle again. According to Flair in the interview, Michaels was okay with it. When I heard that, I was surprised, but we cannot control other people’s actions, so I suppose Shawn may have let Ric go back on his word, because it’s Ric’s word, not his. I hope the “Heartbreak Kid” doesn’t do the same like the “Nature Boy” does. But another thing that’s been on my mind as of late is the recent injures in the WWE after their pay-per-view, WWE Over the Limit. Randy Orton has a bummed shoulder; Ted DiBiase received a concussion after being slapped from R-Truth, etc. Reason why this has been on my mind is because eight days later on WWE Monday Night Raw, some younger talent got pushed, such as Evan Bourne. I’m not fully against this. As of me writing this, there hasn’t been an episode of Raw yet, but I can’t see WWE Creative keep pushing Evan Bourne, because of such stars like MVP. How is Bourne and MVP similar? MVP got a major push but WWE Creative pulled the plug on him, and now, at least for a fan like myself, I cannot see MVP ever being a superstar higher than a mid-carder. Would I love to see younger stars get pushed? Yes, because WWE needs to start building for the future. Stars like the Undertaker, Triple H, John Cena, Edge, etc. don’t have much left in them to be in the main event. The Undertaker has been in the main event picture; well, since the end of 1991 when he defeated Hulk Hogan for the WWF title at Survivor Series 1991, and Triple H moved on the scene when he became WWF Champion the night after SummerSlam in 1999. So yeah, WWE needs new main eventers, but the only way I can see this happening is because of these injuries. Granted I hate seeing guys hurt, but this is the only way WWE would start pushing new guys, to see if they stick with us fans as future main eventers. One last thing that’s been on my mind that really drives me nuts and has been pushing me away from Monday Night Raw, but more importantly, professional wrestling, is guest hosts on WWE Raw. Why is this concept pushing away a fan that’s been a fan for his whole life, for over two decades? I find these guest host concept absolutely boring. Boring? For the better part since it started, the guest hosts seem like they don’t know what’s going on with the storylines. Also, I feel like the guest hosts should be related to the business in some way. Shaq, yeah, he’s been coming to WWE events for years. “The Million Dollar Man” Ted DiBiase, Batista, Stone Cold Steve Austin, Bret Hart, Governor Jesse “the Body” Ventura, guys like that make sense. Heck, Bob Barker doesn’t have anything to do with the business but he was a great guest host. I also think Ozzy was great too, but that’s me. In the end, guest hosts seem to be coming to an end with Bret Hart as General Manager of Raw. At least to me, I’m hoping the guest hosts thing ends soon, because I find the concept to be really pointless and boring, way past its prime, which, to me, was last summer. But again, that’s my opinion, and I’m sticking to it. The Philosophical Final Thoughts: Looking at the current state of the business we know and love of professional wrestling, I feel like it’s in a drought. Concepts like guest hosts and legends like Ric Flair and Hulk Hogan coming back and wrestling again doesn’t help the state of the business. Guest hosts concepts are boring and pushes people away, and legends like Flair and Hogan can’t wrestle, and no one wants to see guys who are as old or almost as old as their grandparents wrestle. With main eventers injured, I hope newer stars get pushed and keep getting pushed, because WWE needs new stars within the next two-to-three years. This is Eric Darsie from Minnesota, until next time….